When I ask my clients what’s one thing they want to get out of our coaching together, what I hear the most is that they want to feel “more connected” to their body. Do you ever want that for yourself, too? But do you ever wonder, “How in the world do I even do that?” Like, what does that even mean? To me, being connected to my body means being aware of and feeling all the different parts of my body deeply and intimately. It means understanding what various sensations in my body mean for me. It means feeling WHOLE in my body. That all parts are working together. It means being able to sense sickness, tension and pain in my body and knowing how to heal myself. As I’m writing this out I’m seeing how big of a task that can actually be for most as we are never formally taught how to connect with our body in school. We’re taught about obscure historical events and prime numbers, but never shown how to cultivate the greatest relationship we’ll ever have – which is the one we have with our own body. 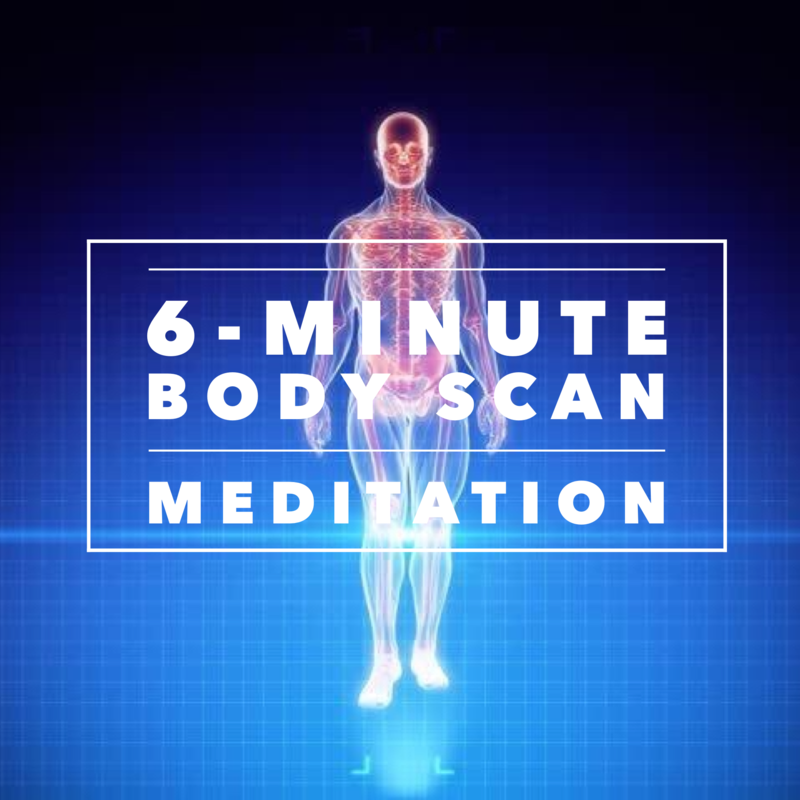 I recently had a VIP Coaching session with a distance client and was inspired to create this 6-Minute Body Scan Meditation and to share it with you as well. If you’ve ever wondered, “How do I connect with my body?” I would offer you this really simple guided meditation and have you report back to me about what you experienced. 1. Sit tall and comfortably in a chair or on the floor with your back supported. 2. Close your eyes and take 3-10 breaths in through your nose, and feel your breath without trying to change it. Feel your body relax and soften with each exhale. 3. Then, like an elevator, bring your awareness down into your belly. It can help to also nod your chin slightly as if you’re looking down into your belly. 4. Feel the sensations in your belly as you breath. Notice your belly expanding on the inhale and fall on the exhale. Stay here for another 10 breaths feeling the sensations in your belly around your navel. 5. Continue to breathe in and out from your belly, and from your belly, notice any other area of your body that is drawing your attention. Notice where you may feel tension, or tightness, or numbness. Notice an area of your body that may be jumping out at you. 6. From here, continue to breathe while you feel the sensations in this area of the body, perhaps it is your jaw, or your neck. You do not need to do anything other than feel the sensations here. 7. Stay on this area for as long as your consciousness will allow, or until you feel complete. There is no end-goal here with this technique. The purpose here is to bring more awareness to various areas of your body, to increase the Felt Sense of the body. 8. You can complete the meditation at this point, or if time allows, continue to a new area of the body that is calling your attention, or to where your consciousness guides you. 9. Complete the meditation by bringing your awareness completely back to your belly and your breath. 1. What area of your body drew your attention? 2. What sensations did you notice when you observed this area? Use the guide below for suggestions. 3. What thoughts, images, textures, or colors, if any, did you observe? 4. What emotions or memories came up for you during this process? 5. Draw out the sensations or images that came up for you. If you felt like your jaw was locked like a vault, draw or doodle this as you journal. If your back felt like a stiff board, sketch it out as a way to deepen your experience, bringing more awareness to this area of your body. Color – gray, blue, orange etc. This is an incredibly simple way to begin to cultivate a deeper relationship with and to connect with your body. I would recommend starting off with this mediation once a day for about 5-10 minutes. If you’re new to meditation, I would suggest to do this right before you go to bed when you are free of distractions. After you’ve become more accustomed to this technique, you can do this any where and any time, on the bus, at work, or in the shower.